Harry N. Abrams, 9781419727474, 48pp. Amy Bates is the illustrator of Bear in the Air, Minette’s Feast, and The Dog Who Belonged to No One. She lives in Carlisle, Pennsylvania. "Mixed-media images by Bates (The Big Umbrella), washed in yellows and browns and framed by woodblock motifs, give readers a vivid sense of the historical context while infusing the story with a timeless emotional immediacy. Newman (Ketzel, the Cat Who Composed) skillfully modulates her narration, capturing her protagonist’s feelings of excitement, loneliness, and fear. The ending, handled with both restraint and warmth, relies on one of those improbable twists of good fortune that define so many immigrant stories—and it’s based on a real event." "Beautifully designed and illustrated . . . The watercolor illustrations artfully capture an era and people." "Newman's spare yet evocative text works well as a read-aloud, and the solution to Gittel's problem . . . is both clever and true . . . She [Bates] employs Old World style decorative frames throughout (setting off both art and text), appropriate to the story's turn-of-the-century setting." "The illustrations are beautiful . . . Classroom teachers can use as an example text showing one child’s story of immigration. An excellent addition to a library collection." 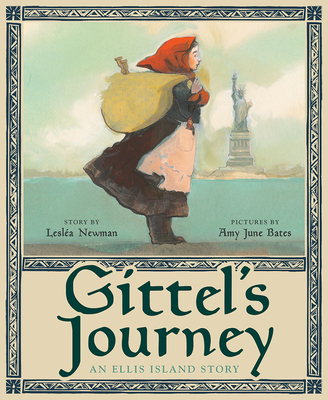 "Newman tells Gittel’s story with sympathy and tenderness, incorporating Jewish phrases (italicized) and customs and placing within it facts about that time and place. Gittel’s every emotion is felt in Bates’ soft, earth-toned, framed illustrations reminiscent of old-time sepia photographs . . . A heartfelt, lovely evocation of one facet of the immigrant experience."